Print Servers are stackable, stand-alone units that let you attach any brand of printer - not just Lexmark printers - to a network. The MarkNet Pro 3 can support up to three printers at the same time - two through parallel ports and one through a serial port. 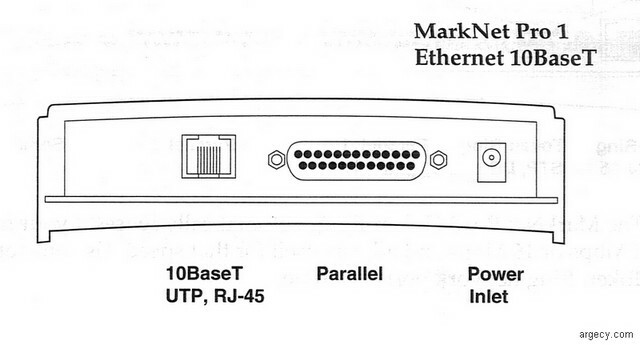 The MarkNet Pro 1 provides a single parallel port connection. MarkNet Pro 3 models can also connect an external fax modem to print your incoming fax on a PostScript Level 2 capable printer. Run a load ratio report to determine the optimum engine speed or printer model for your area. Cost Center Utility Assign printers to departments and charge them for their printer usage. Graphical Reports Use the power of graphics to quickly describe printer usage and reflect printer trends. Top-of-class print servers that ensure trouble-free performance in simple or complex network printing environments. Flexible: Provides direct connection of virtually any printer to a network, including dot matrix, inkjet, and laser printers.